The Parrot Wall Panel is a wonderful addition to liven up the walls of any play area, classroom, waiting room, or home and provide hours of educational fun! The Parrot Wall Panel is a wonderful addition to liven up the walls of any play area, classroom, waiting room, or home and provide hours of educational fun! 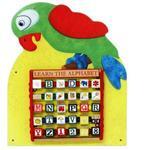 It boasts adorable artwork of squawking parrot perched on top of our highly educational Learn the Alphabet. Kids will learn their ABC’s corresponding words that match the letters (ex: A=apple) as they play with the individually embossed wooden blocks! This panel is part of a series of smaller wall panels intended for individual play. Make sure to check out the other cute Bear, Cow and Frog Wall Panels to complete your set!